No local fruit appeals to the imagination as does the illustrious Shimaruku or West Indian Cherry. If you notice cars at the side of the road in the weirdest places, about one or two weeks after some heavy rains, and people enthusiastically picking what looks like red berries, then it’s a safe bet it is Shimaruku they are after, which are either eaten on the spot or collected in cups, bags or whatever serves the purpose of taking this delicacy home. Parents teach it to their children, and grandparents to their grandchildren, although nowadays less frequent than in the past, unfortunately. It is a tradition that helped many residents of the island to a considerable level of resistance, health-wise, thanks to the super power of these fruits. 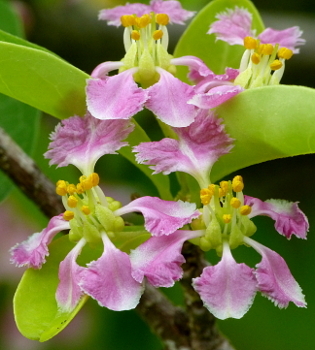 The shimaruku tree, scientifically known as Malpighia emarginata, is not rare in the sense that the species occurs widespread from Mexico, Central America to South America and on several islands in the Caribbean. These are the places in the world where the tree is native, but because of the powerful and valuable uses of the fruit, the tree has also been brought to Asia and the United States for cultivation. The tree itself is hard to spot in the dry season and especially for people who are not in the habit of observing trees in all seasons. In the wild the species usually occurs as a shrub and only in some places as a ‘real’ tree up to 5 meters high. It usually appears to be branched irregularly. The color of the branches and the trunk is greyish brown. The leaves are oblong and are positioned quite close to the branch, with only a short stem. They are tapered and rounded at the tips. In the rainy season the leaves are bright green to dark green in color and as the conditions become dryer they start exhibiting white or greyish dead spots which result in a somewhat ‘scabby’ look. If the dry period is prolonged, then the tree loses all leaves and only a seemingly dead, irregularly branched trunk remains, for the time being. The Shimaruku does not have an easy life on the island, with the dry, windy and hot weather conditions. In the Greater Antilles it rains a lot more throughout the year, hence over there the tree carries leaves on an almost continuous basis. It produces flowers and fruits quite regularly as well. That kind of luxury is unknown on our island. The dry period can last for several months, hence it does not make any sense for the tree to invest energy in producing flowers and fruits while the chances of finishing this process, of creating a new generation, are virtually nil. The plant enters a state somewhat like ‘hibernation’, a ‘drought sleep’ and reduces all internal processes to a minimum. By dropping the leaves the plant avoids evaporation of moisture. In this way the plant protects the valuable resources it stored. Once the first good rains fall, the plant enters ‘overdrive mode’. Because on Curacao one can never be sure if the rains will continue for a while or that the one big shower is all there will be, the plant puts a large amount of energy in reproduction right away, in order to secure the new generation. Within a record time of only a few days after the rain the first flowers appear. These relatively small, up to 1.7 centimeters in diameter, flowers have a special appearance. The five petals around the center are pink-whitish to purple-whitish in color and the bright yellow stamens distinctly contrast with the green color of the center. The edges of the petals are wrinkled. Usually about 3-5 flowers are grouped together. When the plants are blooming there is a burst of activity. Bees, wasps, flies, bananaquits, and even hummingbirds are able to locate the flowers unerringly. The flowering period does not last long, however, no more than a few days. Less than a week after the first rains small green berries appear on the tree. Within 2 weeks after the rains the fruits are ripe and the new generation is ready to be distributed to other places on the island thanks to the birds, rabbits, bats, deer and other animals that eat both the fruit pulp and the seeds, and deposit the seeds elsewhere covered with a nutritious layer of manure. The Shimaruku is not the only plant that applies this kind of emergency flowering and fruit production. It is a strategy based on making use of resources as effectively as possible in a difficult environment, to ensure that reproduction is guaranteed. In years that the rains continue for a longer period it is even possible that the trees produce flowers and fruits a second time, together with leaves essential for photosynthesis to produce the necessary nutrients to continue to make reproduction possible. Part of the self-produced food will be stored in the plant for times of crisis, to have enough ‘fuel’ to produce the next generation after a long dry period. The round red juicy fruits are true vitamin bombs. Adults only need to eat 3-4 of these berries to meet their daily recommended amount of Vitamin C. Worldwide, the juicy orange-yellow pulp is praised for the content of vitamin C. And this while the fruit usually does not get much bigger than 1.5 centimeters, especially not on Curacao. 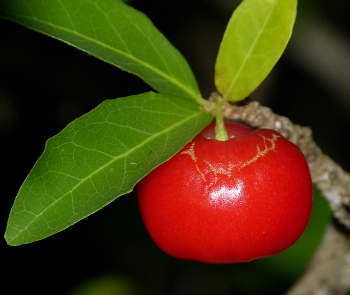 On Curacao there are some trees that produce fruits of up to 4 centimeters in diameter, but in most cases these particular trees have been brought in from other countries, including Suriname. 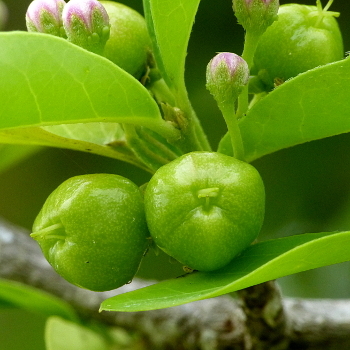 The small fruits produced by the native variant are in fact adapted to the difficult climatic conditions on the island. It is not “smart” to invest too much energy and precious water in big juicy fruits while a little less also does the job. When the rains are a little more abundant the fruits sometimes get a little bigger, however. In several countries, the juice of this fruit is added to other fruit juices to naturally add vitamin C, which is also better absorbed by the body than synthetic vitamin C.
The green fruits of the Shimaruku, vitamin C reservoirs! Now for the official statistics: 100 grams of fruit contains around 1670 milligrams of vitamin C, which is 1864 percent of the recommended amount of vitamin C per day for adults, as determined for the population of the United States. The Shimaruku is the second richest fruit of this vitamin compared to all other known edible fruit species. This natural antioxidant can therefore significantly contribute to increasing the resistance of people against virus attacks and other diseases. In addition, the fruits contain few calories, only 32 per 100 grams of fruit, so the fruits will not cause weight gain, and contain absolutely no cholesterol. The fruits are also rich in Vitamin A (26 percent of the recommended daily amount per 100 grams fruit), and contain small amounts of B vitamins, iron and some other substances. The most remarkable thing about this fruit is, that the green fruits contain more than double the amount of vitamin C compared to the ripe fruits. If high amounts of the vitamin are important it would be even better to chose the green fruits over the ripe fruit. The nutritional values of the fruit are based on international values and may thus be somewhat different on the island due to the soil type in which the trees grow and the climatic conditions. Further local research into this, as well as into the properties of other local fruits, would not be an unnecessary luxury. The taste of the ripe fruit is sweet and sour and Shimaruku is in no way comparable to the normal cherry, such as those which are sometimes offered in the supermarket. The fruit has three yellow-white seeds which are attached to each other as a sort of ‘butterfly’. The seeds are edible and are used in some cultures to stop severe diarrhea. Also on Curacao different parts of the plant are used. According to local expert Dinah Veeris an extract of the bark and the fruits can be used against diarrhea and dysentery. And a lot more can be done with the fruit itself. Internationally, fruit juices are quite popular, and jams and syrups are also often made. On Curacao this is also still done, especially by older people as well as those who are interested in the processing of local vitamin bombs. View inside the fruit of the Shimaruku. On the left a seed without pulp. In reality one will not collect the fruits one by one to make juice or syrup. Usually a large cloth is draped around the tree and then the trunk gets a hefty shake in order to collect a reasonable amount of fruit in a short time. The fruits will then be placed in cold water. It is said this will trigger the worms, if any, to leave the fruits. Then the fruits can be processed into jam, juice or syrup. During the many trips with school children on the island one thing became clear, to my great joy. Most children know at least what a shimaruku is, and there is no nicer experience than to watch the entire pack sitting under, in the middle and in the top of the tree to devour the sweet and sour treats or to collect some for brothers, sisters, father and mother at home. Usually with a big smile on their faces. Great article about our Shimaruku. I have about 21 shrubs in my garden and always look forward to the good rain shower that will provide an abundance of shimaruku for us.